Foster had his chiro appointment Monday, and the results were both encouraging and somewhat as expected. He was a bit back sore, so the vet examined the saddle fit and found that the soreness is due to his pelvis being out-of-whack rather than due to tack. Always great to hear, because I’m not quite ready for another saddle flocking. Other than a small adjustment around his withers, all of Foster’s issues seems to revolve around his hips and pelvis. She noted that his pelvis was particularly wonky, and I should expect him to travel straighter as a result of her adjustments. After getting the day off yesterday, today will be a return to work and it would be great to see some improvement as a result of the chiro session, which did not come cheap, sadly. A possible recheck in 2 – 4 weeks may happen as well. Learning self carriage- better hind end muscling will only help! Both vets have wanted to start introduce exercises into Foster’s regimen that will help him develop his hind end. Essentially, hills or cavaletti work. Since I am both adverse to trail riding and not familiar with where the hill in my area is (not to mention not having daylight during the week to get outside the arenas), I’ll be looking into incorporating cavaletti into our schoolings. Also, I need to get him to lift his back as we groom, working up to lifting his back 5 times for 5 seconds each, in order to strengthen his back muscles as well. Can anyone out there point me to a good resource for cavaletti and pole exercises? Of course we will still be jumping occasionally, but other recommendations for hind-end exercises would be great! Foster may look like a body builder by the end of the year with all this muscle growing! Now I just need to hit the gym to keep up! Thats great that the chiro was able to straighten him out and that you don’t have to pay for another reflocking! I’m glad I’m not the only one adverse to trail riding 😀 Please send any exercises you get! 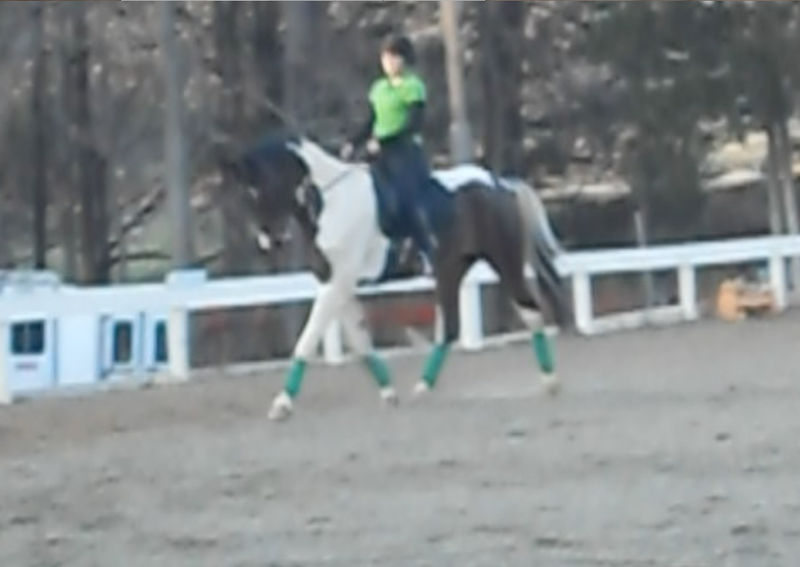 I have a weak hind end guy too. I’ve always just used poles to strengthen the hind end, and a lot of forward and back in the gait, as well as transitions skipping gaits (halt –> trot, walk –> canter). I also do a fair portion of hill walking. I should probably do more to strengthen Pig, but he’s so terrible with poles (gets flustered, totally misses with his feet and rolls poles). I’m interested to see what other people offer as advice! 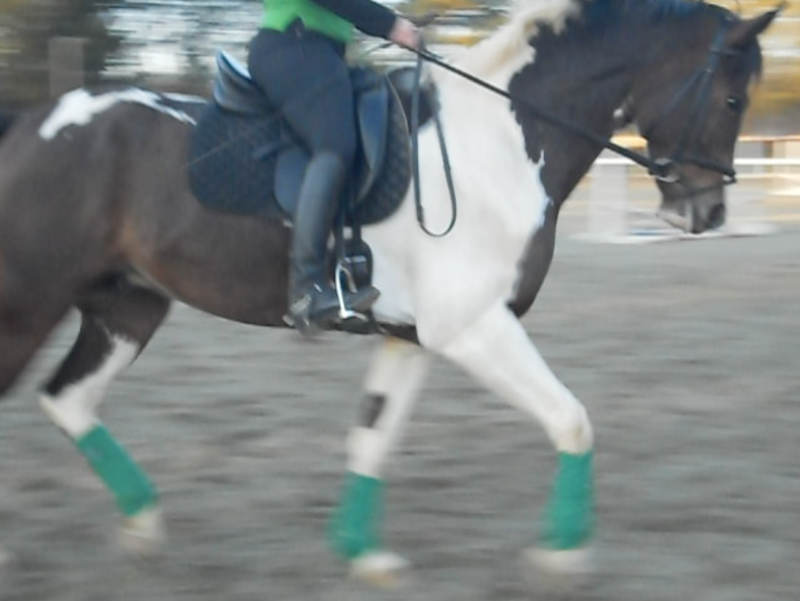 glad the chiro session was so productive (and so nice that your tack is still fitting appropriately – what a relief!). that gif is kinda hugely inspiring actually – definitely makes me want to do more raise pole / cavaletti exercises. let us know what you try!